Known for the expertise in automobiles engineering German manufacturers have always led the way when it came to adapting technology well before it becomes the industry standard. And now in an effort to reduce overall vehicle weight, Audi is introducing new lightweight glass fiber-reinforced polymer (GFRP) suspension springs in an undisclosed new model in 2014. Despite having a thicker strand and larger-diameter coil, the new Glass-Polymer suspension is approximately 40 percent lighter than the steel spring it replaces, which allows the automaker to tune the suspension for a more precise driving experience. So what is this GFRP ? and what has Audi actually done with it ? Lets find out. Why Glass Fibre-Reinforced Polymer ? Weight reduction is now the main issue in new-generation vehicles. Weight reduction can be achieved primarily by the introduction of better material, design optimization and better manufacturing processes. The achievement of weight reduction with adequate improvement of mechanical properties has made composite a very good replacement material for conventional steel. Selection of material is based on cost and strength of material. The composite materials have more elastic strain energy storage capacity and high strength to weight ratio as compared with those of steel, so multi-leaf steel springs are being replaced by mono-leaf composite springs. The material selected is glass fibre reinforced plastic (GFRP) and the epoxy resin can be used which is more economical to reduce total cost of composite leaf spring with similar mechanical and geometrical properties to the multileaf spring. The composite leaf spring is fabricated by hand lay-up technique and tested. 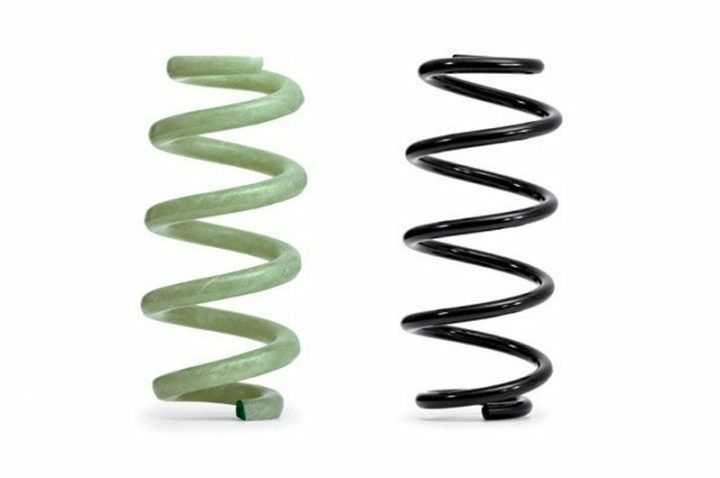 Compared to the steel spring, the composite spring has stresses that are much lower, the spring weight is nearly 74% lower. Resistance to any chemical and natural reactions. Virtually any shape or form can be moulded. Audi’s new lightweight suspension springs made of glass fiber-reinforced polymer (GFRP) will be used in their upper mid-size model before the end of 2014. As stated earlier the GFRP spring is some 40% lighter than a steel spring. Diving in the maths behind this we find that a steel spring for an upper mid-size model weighs nearly 2.7 kilograms, a GFRP spring with the same properties weighs just approximately 1.6 kilograms. Together the four GFRP springs thus reduce the weight by roughly 4.4 kilograms (9.7 lb), half of which pertains to the unsprung mass. “The GFRP springs save weight at a crucial location in the chassis system. We are therefore making driving more precise and enhancing vibrational comfort,” said Dr. Ulrich Hackenberg, Member of the Board of Management for Technical Development at AUDI AG, in a release. The GFRP springs are made by twisting long glass fibers together, which are impregnated with an epoxy resin. Additional fibers are mechanically wrapped around the core at alternating 45-degree angles plus and minus the original core to counteract the stresses acting on it. The springs are then cured at high temperatures. GFRP & The Audi RS7 Sportback? Audi has not confirmed which “upper mid-size model” will be the first to benefit from the technology at this stage, though given its high cost and high-performance characteristics there are rumurs of GFRP making its debut in the Audi RS6 Plus that leaked online recently.